Breathe in and out. Now repeat for as long as possible: Bittern? Sitar? No, I said CITTERN! Bittern? Sitar? No, I said CITTERN! At a friend's daughter's third birthday party recently, another of the adult guests had brought a rare and unusual musical instrument, on the off-chance that he might have a chance to play it. But the general mayhem of a room full of partying 3-year olds was very unconducive to performing (what WAS he thinking?). After the departure of said gremlin pack, however, Alastair was persuaded to let me have a go at playing his cittern. I confess I thought he said he had brought his sitar. He had cycled over to the party with what was clearly some form of stringed, necked instrument in a gig bag on his back. 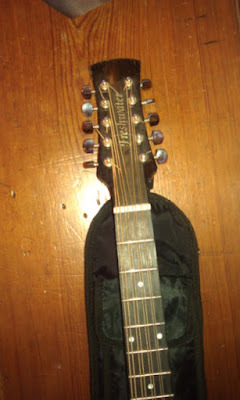 When he said it was (I thought) a sitar, I thought that it must be a very small one! The cittern, however, is an old European, rather than Indian, precursor to the guitar. 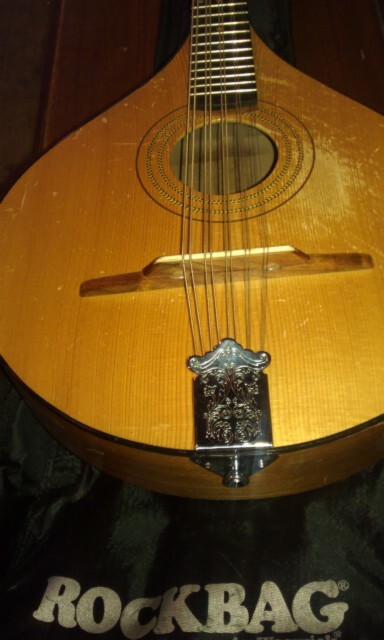 Also known as the cither, the cittern is a stringed instrument dating from the Renaissance period. 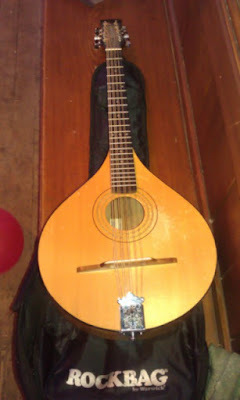 A more accurate description, to my mind, would be that it is like a mandolin, with paired strings, but with five pairs rather than the four pairs on a mandolin. "Now is the Solstice of the year..."